Then you’ll love Alice in Wonderland by Les Enfants Terribles. Then you won’t want to be late for this limited run of Alice Adventures Underground where you can tumble down the rabbit hole and meet a lot of wonderful characters. Alice Adventures Underground is back following on from its sell-out run back in 2015. At the Vaults deep under Waterloo Station, Les Enfants Terribles and ebp bring their Olivier award nominated Alice’s Adventures Underground back this spring 2017! With this fun immersive adventure you can tumble down the rabbit hole and make a series of choices in a theatrical adventure like no other, with so much more to explore than ever before with some new characters! Meet various wonderlands famous and curious characters. ave tea at the biggest un-birthday party with the Mad Hatter; let the Cheshire Cat take you hither or thither plus rise against the fearsome Queen of Hearts. This is a ‘Theatre Extravaganza‘ and one not to be late for (missed). 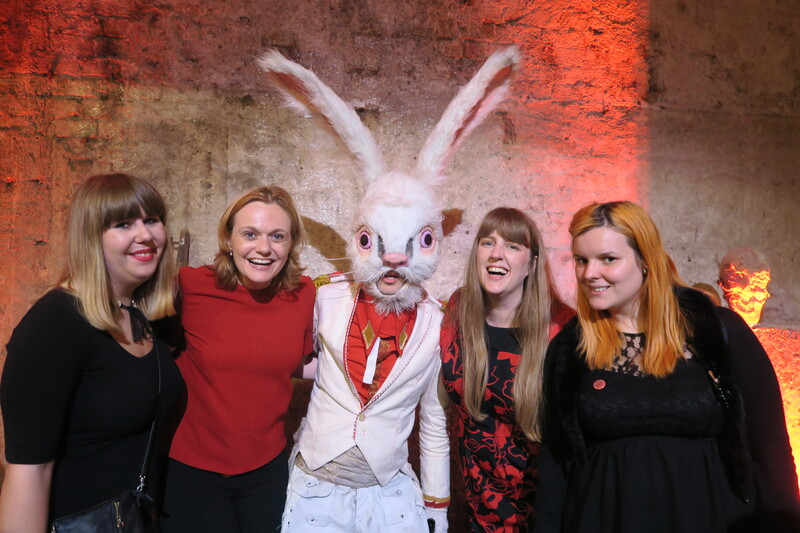 Thanks to Alice Adventures Underground who let some of us from the community of Love Pop Ups London come down to follow the white rabbit down the magical rabbit hole of Alice Adventures. Read our blogs/reviews from the comments section below. The same company that brought you the brilliant Goosebumps Alive are back for the second time with this immersive, surprising and imaginative unique re-telling of the classic Alice in Wonderland Story. Except the unexpected, go with the flow and release your imagination and this will be one of the best shows you’ll see this year. Click the link bellow for a full review. Currently running in The Vaults is the immersive theater experience like no other. Les Enfants Terribles’ and ebp have once more brought their Olivier award winning Alice production and it is just as breathtakingly good as the reviews say. I would also like to include a shout out to the fab acting skills in this show. The tea party scene is mesmerizing in it’s own and the attention to detail with the outfits and set (in this scene but throughout also) is amazing. I absolutely loved the character who led our group (their name escapes me right now!) but they were hilarious and displayed the type of acting that could be seen in a movie.